Gorilla® Epoxy is taking epoxy to the next level, the Gorilla® Tough level. 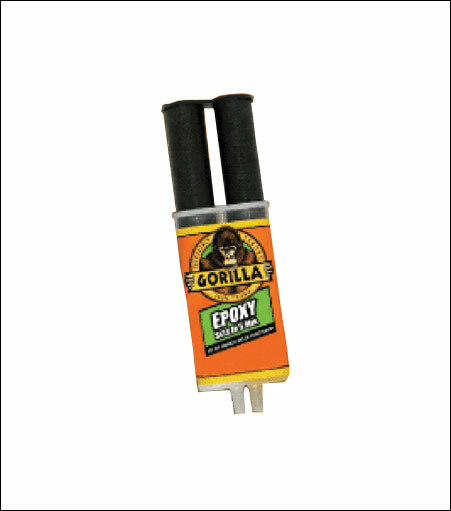 Gorilla's two-part epoxy is an Impact-Tough Formula, providing high impact resistance and strength to handle the toughest projects. Plus, it's fast! Gorilla® Epoxy sets in 5 minutes and can be handled in 90 minutes. Gorilla® Epoxy gap-filling capabilities and all purpose formula easily bond steel, wood, aluminum, ceramic and much more. Impact-Tough™ Formula - hybrid technology improves overall adhesion strength and flexibility. Gap Filling - fills voids and bonds uneven and vertical surfaces. 5-Minute Set - plenty of repositioning time for the perfect fit. Water Resistant - withstands moderate exposure to water. Easy-to-Use Reusable Syringe - separate barrels of resin and hardener keep epoxy from hardening, plus syringe dispenses evenly and includes a cap for multiple uses. Solvent Resistant - will not break down from exposure to common solvents. Low VOC and Non-toxic Once Cured - safe for everyday handling.